This is the fourth and final post in a series talking about specific ways to improve English education in Japan. You can see my thoughts on elementary school English, junior high school English, or senior high school English in these links. 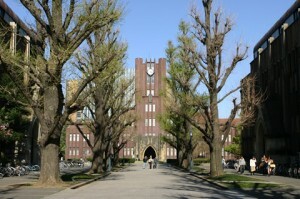 Almost all students in Japan continue studying English and perhaps a third language at university. Classes tend to be either a continuation of high school (‘academic’ text analysis or test preparation) or general (almost ‘eikaiwa’ style) classes. Universities have a lot of flexibility with regards to goals, class sizes, materials, etc. In many cases individual teachers decide the content of classes within a loose framework provided by the institution. It is very difficult to generalize effectively about university English. Right now students can work extremely hard to get into university, but once they get there there is much less pressure leading to graduation. For many students, graduating from university is a given, and the real hurdle is securing decent employment. In recent years graduate employment has become extremely competitive, and students start looking for a job any time after their second year, often spending much of their third and fourth years on job-hunting activities such as attending seminars and interviews. Some companies, most notably Rakuten and Uniqlo, have started prioritizing English skills. The biggest changes I would like to make at university do not originate here, but rather at the earlier levels. For example, a lot of my time at university is spent trying to encourage students to develop self-study habits of reading and listening to English, and help them practice expressing themselves in written and spoken English. Most of the students can’t do that when they come to us, so my first priority is to build this foundation. My classes are basically extensive reading, presentation skills, discussion skills, and online independent study. In an ideal world, students would have already gained these skills and habits in junior and senior high school, and would come to university already able to read and write, listen and express themselves in English. They should know how to study English, and be able to do so effectively should they choose to do so. We could then spend our time at university developing more advanced skills (oral presentation, academic writing, online correspondence, social media management) that would serve students in the future. I only have four things I would like to say about university English in Japan. Given my position as an English lecturer, it may seem as if I am shooting myself in the foot here, but I really think this is the way we should be thinking (you can see more of my thoughts on university English in this video). I can think of no reason for any student who is not applying to an English or linguistics course to have to take an English test for university. The fact that almost all students do have to take these tests is incredibly harmful to both motivation and achievement at the high school level. Because university entrance tests are designed to select students based on their academic potential, they have become a kind of arms race. The tests get harder and harder, the students study more and more vocabulary and complex grammatical forms, and then the tests are made harder again. As all students have to take the tests, they are forced to study English that is far beyond them, an exercise in discomfort and futility. No wonder that surveys show most students hate English by the end of the first year of junior high school. If students didn’t have to take an English test as part of university entrance, they would be able to work towards developing their practical English skills, working at an appropriate level. The certification system I mentioned in my thoughts on senior high school would come into play here, giving students a reason to continue with their English studies. English classes at university still mostly consist of 20-60 mixed-ability students in a classroom once a week. Why? This is a colossally inefficient way to teach and learn a language. Instead of forcing students to take specific classes, universities should allocate a number of credits for foreign language study, and allow students to customise their own program. This could involve a mix of independent monitored study and formal classes, in English or other languages. Even better, remove all elements of compulsion. Don’t require any language credits. University language programs should consist of language centres that provide access to information, training, resources, and certification. Ideally students would determine their own goals and programs based on their interests and future needs. A variety of courses should be offered through the language centre, as well as opportunities for group study, short courses abroad, intensive courses in the university holidays, etc. If language skills are valued and recognized by companies, relevant and practical training will be appealing to students. There should also be support for students to take various tests and certifications during their time at university. Of course, the language credits eliminated in 2.) above could be allocated to independent study and elective courses here if institutions are timid. Right now, most students wanting to study abroad must take time out of their studies, pay for both their university in Japan while they are not attending it and the institution they are attending abroad, make up lost credits when they get back, and potentially miss out on getting a job due to the incredible 2+ year job-hunting season. No wonder 60% of high school students have no interest in studying abroad, it’s actually a bad choice under the present system (even more so if you consider how ill-prepared students are in terms of their language skills). All universities should have wide-ranging study abroad programs that give students credit for the time they spend overseas. Students should not face financial penalties. Companies should not penalize students who are not in Japan during their third year. If these three factors were improved and students were given adequate language skills in school, I think we would see very different numbers on that poll. So that’s the end of this series on improving English education in Japan. I have really enjoyed writing this and hearing your comments here on the blog, on Twitter, and on Facebook. Please let me know what you think of this one. Am I way off the mark? Japan to use TOEFL as university entrance hurdle?